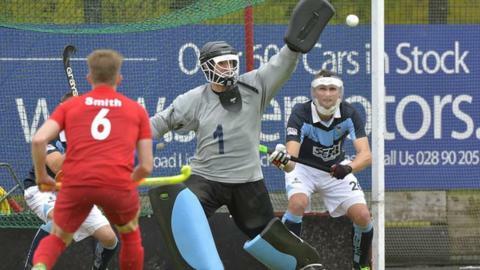 Monkstown showed why they are favourites to win the Irish Hockey League as they beat Lisnagarvey 5-2. Banbridge joined the Dublin side on six points with a thumping 6-1 victory at Railway Union and Annadale drew 1-1 with Three Rock Rovers. Cookstown lost at home to Pembroke with Cork C of I defeating Glenanne. In the women's IHL Ulster Elks, Hermes and Railway Union all won for the second weekend in a row while Ards and Pegasus lost. Andrew Ward opened the scoring for Monkstown with Gareth Watkins grabbing his third goal in two games and Kyle Good converting to make it 3-0 at half-time. However, Lisnagarvey mounted a third-quarter comeback with Andy Williamson deflecting the ball into the roof of the net and Stevie Arbuthnot's sharp finish pulling them within a goal. However, Ward netted his second with an excellent finish from a head-high ball into the area by David Carson. James Lorimer's missed penalty stroke was the final opportunity for the home side to get back into the game and Good's stunning run and thumping drive rounded off the scoring. Banbridge hit Railway Union for six with Neil Gilmore scoring twice and the others coming from Eugene Magee, Stephen Dowds, Josh Moffett and Jamie Wright. Annadale were just two minutes away from their second defeat of the young season when Chris Jackson popped up to equalize against Three Rock Rovers while Cookstown's Stuart Smith was given a straight red card as his side fell 3-1 at home to Pembroke Wanderers. John Jermyn scored a hat-trick for the second game in a row as Cork C of I joined Banbridge and Monkstown on top of the table after a 4-2 win at Glenanne. In the women's IHL Irish captain Megan Frazer opened the scoring in the first minute of the Ulster Elks game at Cork Harlequins and further goals from Rebecca Barry and Laura McAlpine helped them to a 3-1 win. Ards lost 5-1 at Hermes with international Anna O'Flanagan scoring twice to give her five goals in two games. Chloe Brown scored the lone goal for the Ulster side. Railway Union are the third side with a 100% record after a 4-0 success at UCC while Pegasus let slip a lead given to them by Hannah Grieve as they conceded two fourth-quarter goals to lose 2-1 at home to Pembroke. UCD beat Greenfields 4-0, helped by two goals from Elaine Carey.